Detect salient objects and identify them using TensorFlow deep neural network. TensorFlow is a popular neural network framework. This module first finds the most conspicuous (salient) object in the scene, then identifies it using a deep neural network. It returns the top scoring candidates. See http://ilab.usc.edu/bu/ for more information about saliency detection, and https://www.tensorflow.org for more information about the TensorFlow deep neural network framework. This module runs a TensorFlow network on an image window around the most salient point and shows the top-scoring results. We alternate, on every other frame, between updating the salient window crop location, and predicting what is in it. Actual network inference speed (time taken to compute the predictions on one image crop) is shown at the bottom right. See below for how to trade-off speed and accuracy. Note that by default this module runs fast variant of MobileNets trained on the ImageNet dataset. There are 1000 different kinds of objects (object classes) that this network can recognize (too long to list here). It is possible to use bigger and more complex networks, but it will likely slow down the framerate. This module provides a parameter, foa, which determines the size of a region of interest that is cropped around the most salient location. This region will then be rescaled, if needed, to the neural network's expected input size. To avoid wasting time rescaling, it is hence best to select an foa size that is equal to the network's input size. The network actual input size varies depending on which network is used; for example, mobilenet_v1_0.25_128_quant expects 128x128 input images, while mobilenet_v1_1.0_224 expects 224x224. We automatically rescale the cropped window to the network's desired input size. Note that there is a cost to rescaling, so, for best performance, you should match foa size to the network input size. When using video mappings with USB output, irrespective of foa, the crop around the most salient image region (with size given by foa) will always also be rescaled so that, when placed to the right of the input image, it fills the desired USB output dims. For example, if camera mode is 320x240 and USB output size is 544x240, then the attended and recognized object will be rescaled to 224x224 (since 224 = 544-320) for display purposes only. This is so that one does not need to change USB video resolution while playing with different values of foa live. Definition at line 140 of file TensorFlowSaliency.C. Definition at line 147 of file TensorFlowSaliency.C. Definition at line 157 of file TensorFlowSaliency.C. Definition at line 171 of file TensorFlowSaliency.C. References jevois::RawImage::height, itsRh, itsRw, itsRx, itsRy, itsSaliency, LFATAL, and jevois::RawImage::width. Definition at line 163 of file TensorFlowSaliency.C. Definition at line 205 of file TensorFlowSaliency.C. References jevois::rawimage::cvImage(), getSalROI(), jevois::RawImage::height, itsResults, itsRh, itsRw, itsRx, itsRy, itsTensorFlow, LINFO, jevois::rescaleCv(), jevois::StdModule::sendSerialObjDetImg2D(), and jevois::RawImage::width. Definition at line 247 of file TensorFlowSaliency.C. References jevois::rawimage::convertCvRGBtoCvYUYV(), jevois::rawimage::cvImage(), jevois::rawimage::drawFilledRect(), jevois::rawimage::drawRect(), jevois::Module::frameNum(), getSalROI(), jevois::RawImage::height, itsRawInputCv, itsRawPrevOutputCv, itsResults, itsRh, itsRw, itsRx, itsRy, itsTensorFlow, jevois::rawimage::paste(), jevois::RawImage::require(), jevois::rescaleCv(), jevois::StdModule::sendSerialObjDetImg2D(), jevois::sformat(), jevois::Timer::start(), jevois::Timer::stop(), to_string(), jevois::RawImage::width, and jevois::rawimage::writeText(). References jevois::rawimage::convertCvRGBtoCvYUYV(), jevois::rawimage::cvImage(), jevois::rawimage::drawFilledRect(), jevois::rawimage::drawRect(), jevois::Module::frameNum(), getSalROI(), jevois::RawImage::height, itsCvImg, itsPredictFut, itsRawInputCv, itsRawPrevOutputCv, itsResults, itsRh, itsRw, itsRx, itsRy, itsSaliency, itsTensorFlow, JEVOIS_REGISTER_MODULE(), jevois::rawimage::paste(), jevois::RawImage::require(), jevois::rescaleCv(), jevois::StdModule::sendSerialObjDetImg2D(), jevois::sformat(), jevois::Timer::start(), jevois::Timer::stop(), to_string(), jevois::RawImage::width, and jevois::rawimage::writeText(). Definition at line 380 of file TensorFlowSaliency.C. Definition at line 378 of file TensorFlowSaliency.C. Definition at line 379 of file TensorFlowSaliency.C. Definition at line 381 of file TensorFlowSaliency.C. Definition at line 377 of file TensorFlowSaliency.C. Definition at line 382 of file TensorFlowSaliency.C. Referenced by getSalROI(), and process(). Definition at line 375 of file TensorFlowSaliency.C. 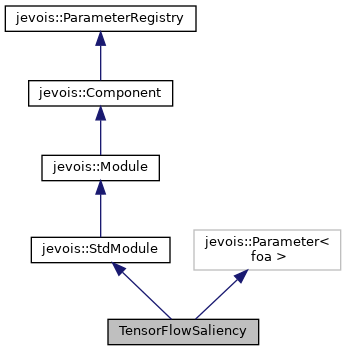 Referenced by getSalROI(), process(), and TensorFlowSaliency(). Definition at line 376 of file TensorFlowSaliency.C. Referenced by process(), and TensorFlowSaliency().